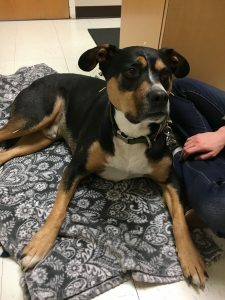 Russell, a 7 year old male neutered boxer mix, presented initially in 2017 for a swelling on the medial aspect of his right tarsus that was noted by the owner. Based on examination and radiographs, a torn medial collateral ligament was suspected. Russell’s owner elected to manage him with a non-surgical approach. During the course of his treatments, he became more comfortable. After his sessions, he bore more weight on his affected leg than previously and was more mobile at home, even jumping up on the bed. Russell was first examined in 2017 for a swelling associated with his right hock along with lameness in that same limb. On examination, he was observed to be sensitive to palpation of the right hock, particularly the medial aspect. Mild laxity was noted on manipulation of the tarsus in a medial-lateral direction. The proliferation was subcutaneous and firm, fixed to the deeper structures. Radiographs were taken and sent to a boarded veterinary radiologist for evaluation. They displayed a swelling in the right tibiotarsal region predominantly on the medial aspect. There was mild irregular periosteal reaction associated with the medial cortex of the talus, distal to the medial malleolus. Mild periarticular osteophyte formation was associated with the dorsal aspect of the distal intertarsal joint. The left tarsus and stifle were normal when evaluated. The radiologist concluded that these areas of remodeling and soft tissue swelling could be secondary to a medial collateral ligament injury. There was mild osteoarthritis associated with the right intertarsal joint. Fortunately, no sign of joint sepsis, aggressive osseous lysis or fracture was observed. A consultation with a boarded veterinary surgeon was obtained. After options were discussed with Russell’s owner which included surgical repair, they elected a non-surgical approach for various reasons. Joint supplements and omega fatty acids were prescribed. Due to his obesity, a diet was attempted, which proved challenging. Anti-inflammatories, like Rimadyl, were used sparingly when needed. For a year, Russell appeared to be fairly stable at home with these measures. Then, he slowly became more uncomfortable on his right hind leg. These changes were observed by his owner at home, and she brought him in for evaluation. There was no known trauma that precipitated his initial presentation to our clinic. Russell’s owner is a horse trainer, so he was used to being active on their farm. As his condition changed, he became more sedentary. The rest of his medical history was unremarkable. Russell presented over a year later to determine if he could benefit from acupuncture. A full physical exam was performed and vital signs were noted to be within normal. Russell was overweight with a body condition score of 4/5. He visibly favored his right hind leg. This had worsened since the year before. Muscle wasting was noted in the affected limb, especially the superficial and middle gluteal muscles, biceps femoris, semitendinosus and semimembranosus muscles. In addition, Russell was painful on palpation of his right hock with progressive instability noted on manipulation. Russell also displayed compensatory myofascial pathology in other areas of his body. Heat was noted in the lumbosacral region and a pain response elicited on gentle palpation. Further, a contralateral lameness in the left front leg with a decreased range of motion in his shoulder was observed. When comparing the left to right front legs, the long head of the left triceps was restricted and tense. Russell’s cervical spine demonstrated banded musculature and tension dorsally. Neurologic exam was within normal, including conscious proprioception, crossed extensor reflexes of all limbs, and spinal reflexes. Because of the changes noted, another set of radiographs were taken. These new views demonstrated progression of degenerative changes at the right medial tarsocrural joint, still consistent with a potential ruptured medial collateral ligament. This joint also displayed widening when compared with the initial views. A potential avulsion fragment was noted in the soft tissues medial to the malleolus. Again, there was no evidence of more aggressive disease. 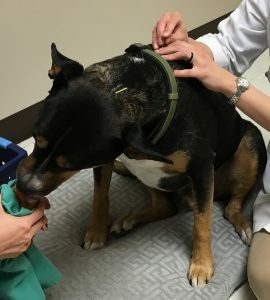 The problem list for Russell included right tarsal pain, lumbosacral spinal pain, left front leg pain and cervical spine tension. Vascular differentials for right tarsal pain and swelling include a vascular tumor, like hemangiosarcoma, or thrombosis. Polyarthritis, tickborne disease, synovitis, tendonitis or panosteitis could be potentials, also. Neoplastic causes, like a synovial tumor, osteosarcoma, hemangiosarcoma, mast cell tumor or hypertrophic osteopathy, should be ruled out. Degenerative joint disease or osteoarthritis could be causes of Russell’s right tarsal discomfort. There is the potential for drug intoxication of some kind leading to an initial trauma in this area. Congenital differentials, like an osteochondrosis dissecans (OCD) or other malformation in the right tarsus, might be the culprit. Immune-mediated arthritis is a possibility. Trauma is another potential differential, and could be from being hit by a car or kicked by a horse. Endocrine or metabolic disorders must be rule out, as well. Cushing’s disease could lead to muscle atrophy and weakness. Instability can be see with diabetic neuropathy. A torn ligament, the medial collateral ligament for example, could lead to the pain and instability noted on exam. There are many potential differentials for lumbosacral pain. Hemangiosarcoma, fibrocartilaginous embolism or anemia could be related. Infectious causes include diskospondylitis, tickborne illness or pancreatitis. Hemangiosarcoma, lipoma, osseous neoplasia or spinal and nerve sheath tumor could easily be the reason Russell is so painful in his lower back. Degenerative joint disease, degenerative myelopathy, spondylosis, intervertebral disk disease, chronic kidney disease, or cauda equina could lead to lumbosacral pain. The pain could be vaccine-induced or due to trauma. For possible congenital causes, Russell could have hip dysplasia or hemivertebra in the lumbosacral spine. Autoimmune etiologies include polyarthritis, immune-mediated hemolytic anemia or myositis. Many types of trauma could lead to lower back pain. Endocrine or metabolic differentials include diabetes mellitus, Cushing’s disease or hypothyroidism. The pathology in Russell’s lower back could be from weight shifting and tension secondary to the right hind leg lameness. For Russell’s right tarsal pain, the definitive diagnosis is a torn medial collateral ligament, potentially due to trauma. This is supported by the presence of a possible avulsion fragment and widening of the medial aspect of the tarsocrural joint on the most recent radiographs. It is suspected that Russell developed some amount of degenerative joint disease in this region secondary to instability. The radiographs taken over the course of a year are not compatible with a diagnosis of neoplasia. OCD lesions or hypertrophic osteopathy were not observed. Due to his mature age, a congenital abnormality can be ruled out. Russell has not had indicators of an infectious or immune-mediated course of disease, and these aren’t consistent with the radiographs. He has had negative 4Dx testing to help rule out a tickborne pathogenesis. Russell is not suffering from diabetes mellitus or Cushing’s disease, so these can be ruled out. At this point in time, a drug intoxication that led to trauma and injury cannot be excluded. We do not have imaging of Russell’s lower back, so the diagnosis is more putative for this problem. When looking at the patient as a whole, it is reasonable to suspect that Russell’s lumbosacral back pain is secondary to his right hind leg discomfort. Again, trauma or intoxication can’t be ruled out. With the length of time between initial presentation and second evaluation, neoplasia can be excluded. There is no evidence to support kidney disease, pancreatitis or other endocrine or metabolic disorders. Although hip dysplasia, hemivertebrae, or spondylosis could be present, I don’t believe these to be the root cause of his discomfort in this region. In addition, Russell is neurologically normal, so we can remove degenerative myelopathy, intervertebral disk disease and cauda equina with some comfort. With the length of time between exams, if Russell had a progressive disorder of this sort, one would expect it to be apparent by now. There is no recent history of vaccination in this region. Russell’s treatments were approached knowing the primary issue couldn’t be repaired (ie. suspected torn medial collateral ligament). With this mindset, the goal was to decrease pain and improve function of areas secondarily affected. Acupuncture was selected as the main method of treatment. It was anticipated that acupuncture would lead to myofascial relaxation and analgesia which would be particularly beneficial in these regions. Russell received five treatments over the course of two months, each including an initial exam to evaluate any changes present. Dry needling was used as the method of stimulation with 0.18 mm yellow Seirin needles (30 mm length). Central points included GV 14 and 20, BL 10, BL17 to 28 and Bai hui. GV 20 was included as a relaxation technique. GV 14, and the Bladder Line points were used to address the banding and pain in those regions. Bai hui is an important point to include for lumbosacral pain. Peripheral points included LU 1, LI 15, TH 14, SI 11 and 12 on the left side to treat the shoulder restriction and pain noted on exam. BL 60, BL 62, ST 40, ST 41, KI 6 and LR 3 were chosen to help with local pain on the right hind leg. BL 40 is a master point for the lumbar spine so was included in Russell’s treatments as well. ST 36 served as an autonomic and peripheral point. As Russell tolerated the treatments very well, the needles were left in place for approximately 15 minutes. Russell has a chronic issue that will require continual management to promote mobility and comfort. It will not be repaired with medical acupuncture. The goal was to improve his quality of life and decrease his pain. This was achieved to some extent. Overtime his back displayed decreased restriction and pain in the thoracolumbar region. Also on his last session, his owner and I noted that he was able to bear weight more evenly on both of his hind legs. While acupuncture helped him overall, the condition did not resolve and nor was it expected to. This was an interesting case to treat because of the chronic, ongoing nature. I wanted to see how much improvement I could provide in Russell’s condition, knowing that the treatments wouldn’t be curative. In cases like this, acupuncture should be just part of the whole in terms of management. A customized brace may be of assistance in providing additional stabilization to the tarsus. Weight management proved challenging, but would greatly benefit him over the long run. Omega fatty acids and joint supplements should be included. Laser therapy wasn’t used but might have improved the outcome. One of the standard treatments for medial collateral ligament rupture of the hock is surgery. For many owners, including Russell’s, this was out of reach. With this in mind, one purpose was to determine what benefit could be provided to patients and owners in this situation. Surgery may provide the best long-term outcome for these patients. Acupuncture and related techniques may be a viable alternative for symptom relief, especially if initiated soon after diagnosis. 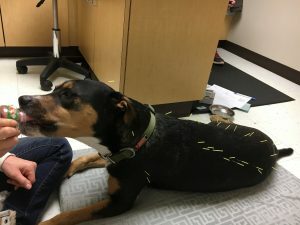 Acupuncture benefited this dog for a period of time when surgery was not an option. The approach could be improved upon, but deserves closer study for future patients. Schwartz Z, Griffon D. Nonrigid external fixation of the elbow, coxofemoral, and tarsal joints in dogs. Compend Contin Educ Vet. 2008 Dec;30(12):648-53. Review. PubMed PMID: 19140105. Aug;38(4):314-8. Chinese. PubMed PMID: 24261303.